7. 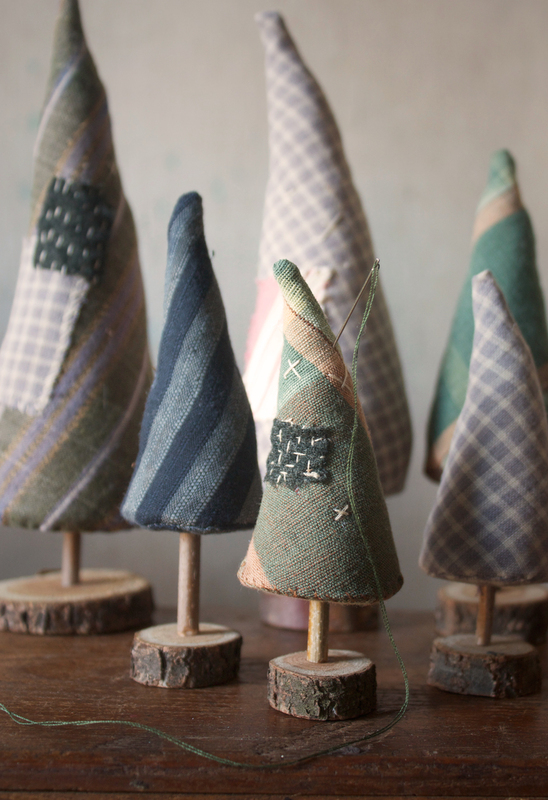 Stitch the tree bottom to the tree – matching the edges as you go. I don’t find it necessary to pin the circle for the little trees but I do for the largest. Stitch all the way around – maintaining a 1/4 inch seam allowance and making small, tight stitches. 8. Clip little notches around the bottom – being careful not to snip your seam. 9. Snip the top corner of seam allowance off. 10. Use the chopstick to turn the tree right side out. 11. Use your exact knife to poke through the cardboard and batting – make two cuts – an X in the center. Use a bamboo skewer and chopstick to enlarge the hole – just enough for your twig. 12. I also used my exacto knife to taper the end of my twig – to make inserting it easier. Check to make sure your twig fits and then remove it. 13. Insert the cardboard – flannel side down. (If you are not adding a trunk skip steps 14 – 17 and I suggest putting a couple pennies inside the bottom before stuffing for weight -add the weight only if you are skipping the trunk). 14. Use a needle or pin to feel for the hole in the cardboard – mark the spot. 15. Use your exacto knife to poke a hole for inserting the twig – couple little slits – just big enough. 16. Push in the twig. 17. 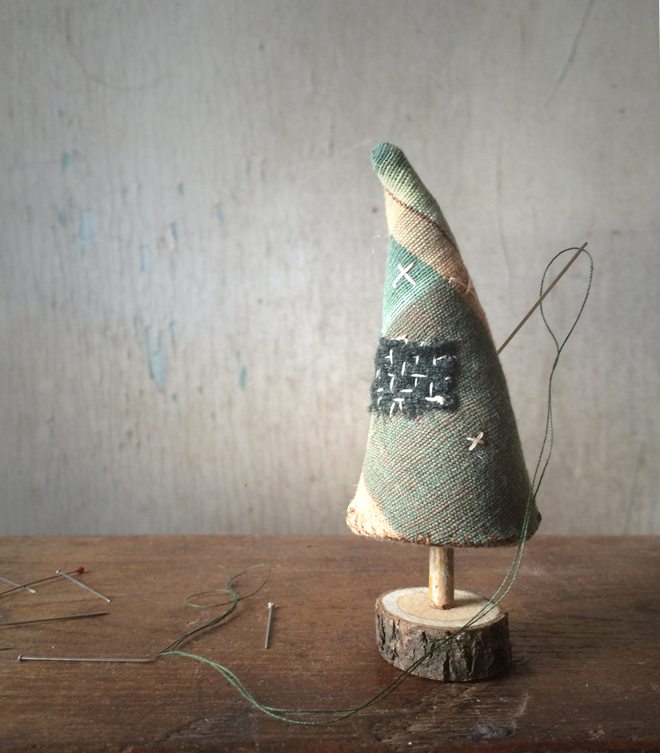 Open up the tree and use a paintbrush to add a little glue to the twig and cardboard. If necessary use pins to keep the fabric away form the glue while it dries. Let the glue dry completely. 19. 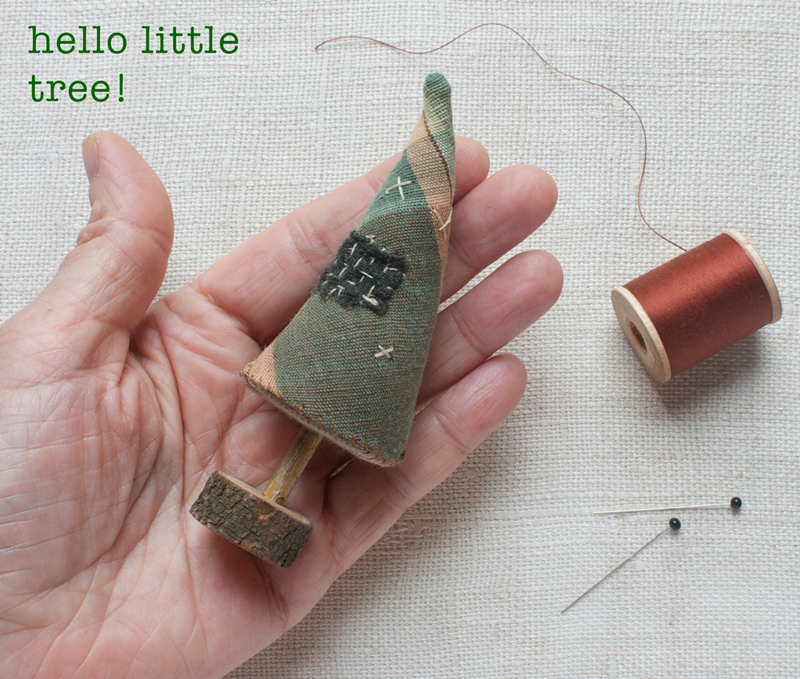 Whip or ladder stitch your tree closed – I’m not worried about visible stitches on my forlorn little tree so I’m making no attempt to conceal them. 20. Use a large needle to move stuffing towards the bottom edge and anyplace else where you want to adjust the shape. 21. Add some patches and stitches for maximum woebegoneness. 22. And finally add a base – you could use spools or wood beads. I drilled holes in little disks and used the exacto knife to taper the twig so it fits snuggly. Thank you for this! Trees are one of my favorite Christmas decorations. I love using all shapes, styles and sizes. Your tree is the sweetest looking thing and I will be making a whole forest of them. You are so sweet to make this a free pattern! Thanks Ann for the free pattern. I just love these little trees. These are adorable. What a delightful gift … thanks so much, Ann! Awesome trees…will work on those today. Thank you for this free gift! Hello little lovely tree! Can’t wait to make one for Christmas! Thank you for sharing! Simply LoVe your work! Love, love, love! Thank you for this lovely tutorial, Ann. Woodland friends will happily wander and play amongst forlorn trees. Wishing you a merry Christmas. Love these! I’ve been adding a “different” miniature tree to my little snowmen/penguins and trees exhibit on my mantels each year, and was running out of new ideas for trees! I’ll definitely need to make one of these! And then maybe I’ll get that squirrel I started awhile back made …make some other critters with trees for a Spring mantel…hmmm! Thank you so much for the free tree pattern! I am working on my first one right now. I really needed a quiet holiday craft and these are perfect. Your generosity is much appreciated. Ann, you are precious and so generous!! Thank you so much! These are adorable! Thanks for the pattern! Going now to dig through my scrap bag! Ann, thank you for this lovely holiday gift! It is also my birthday today, so I feel like I have hit the jackpot! 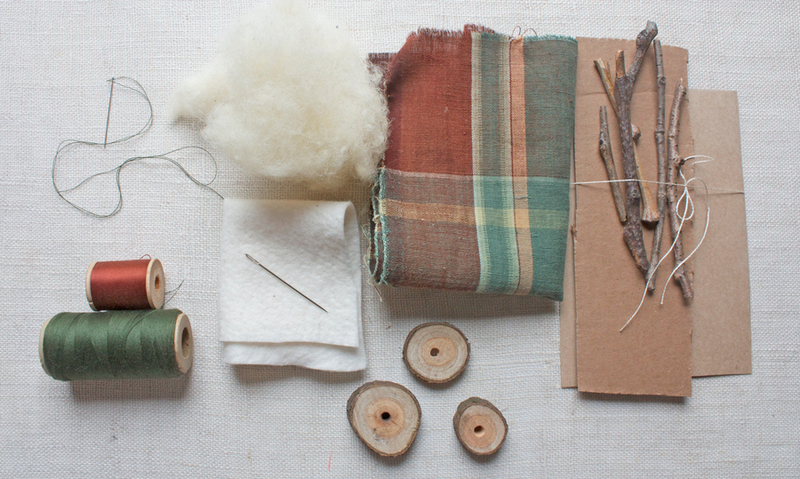 I’m looking forward to some quiet sewing time by the fire and will be giving one sweet tree to a friend. Wishing you all the joys of the holidays! Thank you for sharing this! When i first saw yrees i thought i would like to try to make some-then read you posted-Merry Christmas! Thanks for the tree pattern. Hope to get some made for my mantle. Love these!! Thank you so much for doing the pattern. Looking forward to making a whole forest. Oh and by the way, I got two of the cutest little birdies at Anthropologie. It was so fun to see your name on them. thank you so much for this precious lil tree pattern! Soooo lovely !!! thank you, will surely make some ! Happy Holiday Season to you !!! Oh, these are so wonderful Ann! I plan on making my own little forest. Thank you for sharing this pattern. Happy Holidays to you. Ann, How lovely of you to gift us with a little magic. I can’t wait to make a tiny forest…by a lake perhaps. I’m a new visitor! Thank you for this lovely free pattern! I hope I can make something as cute as your trees! These are so charming, especially the little one – something about small things that has such appeal. I love the thoughtful and considered way you design and create, knowing there is good form and structure, and most especially the hand-stitching. Thank you so much for this generous gift! What a joy these are. Thank you your amazing instructions and pattern and generosity. Thank you! Very sweet little trees! Love your finished trees! The pattern looks so nice and symmetrical, and I can’t figure out how you get it to curve so cutely. It isn’t mentioned in the tutorial that I could find anyway. Thanks for any tips. Hi Natalia- I use wool stuffing and I don’t stuff the tree to firmly if I’m looking for an irregular shape – I stuff lightly and shape with my fingers. The sculpt- ability is one of the many things I love about wool stuffing. Thank you, Ann! I just saw your reply now. Very helpful. 🙂 I hope to make some of these this year. Thank you for the pattern to make such a delightful tree. Very generous! It’s me, Liz from Louisiana. Recall, I brought you a praline candy from New Orleans when I took your first class at Squam Lake a few years ago. I had so much fun and loved meeting you and working with you. A picture of me working in the workshop was posted on your website. OMG I was thrilled because I had been admiring your work for a long time since I first found you on the net. I’ve been holding a box to mail to you since returning home from Squam. The box holds a treasure that I thought you would enjoy. It’s dried okra from a gardener in my little hometown village. I think I saw your home address one time and then forgot where I saw it. If you email it to me please I have the package all ready to fedex. What a brilliant little collection of trees. My son’s name is Oren, which means tree, pine tree or laurel. I’m always on the lookout for tree inspirations. Thank you kindly for making it a free pattern. My wooden dolls have also requested a woebegone tree for their dollhouse. Perhaps they’ll write you a thank you letter, … (once I finish one for them !!) If I could, I’d purchase ALL of your Small Art Paintings. Each is a gem. Kindly, and so loving your art creations. Love the little trees! They make me smile! Thank you for the pattern! Thank you so much – have shared the link to this wonderful pattern and for the mouse. 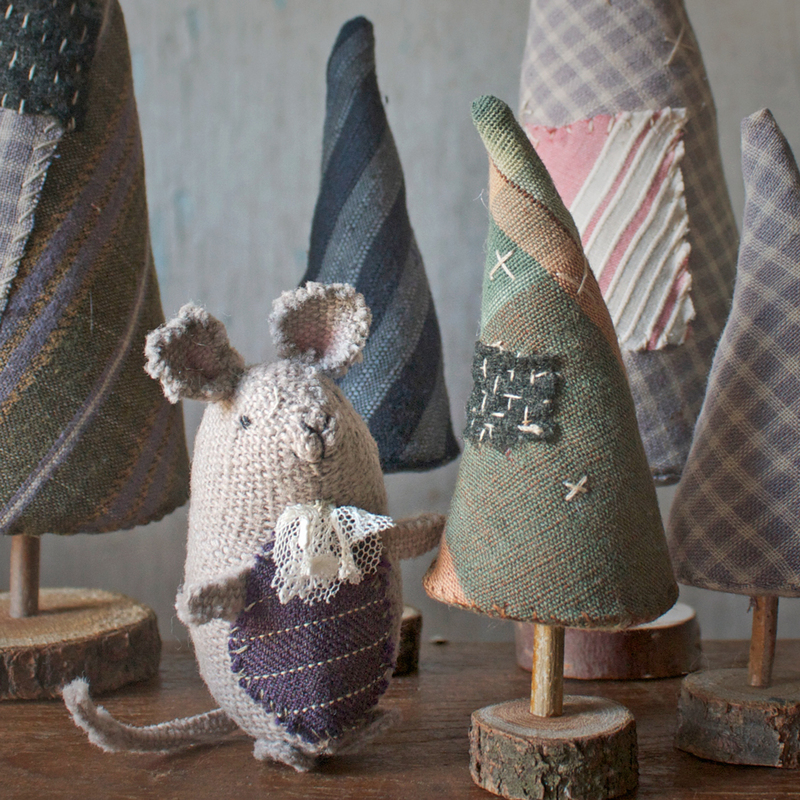 I’ve made some toadstools, going to make the owls and next on the ever growing list, the trees and then a mouse! Thank you for such a lovely pattern. I had not properly stitched in years and on this snowy London day it was the most perfect thing for me. I think i may get addicted to these as I now have so many ideas for fabrics and embroidery swatches to combine to make more. Je découvre votre site et j’avoue que j’adore ces petits sapins si simples à créer et tellement empli de charme. Me gusta mucho lo que nos enseñan. De que país son ustedes. Mandan cosas a Chile, America del Sur.